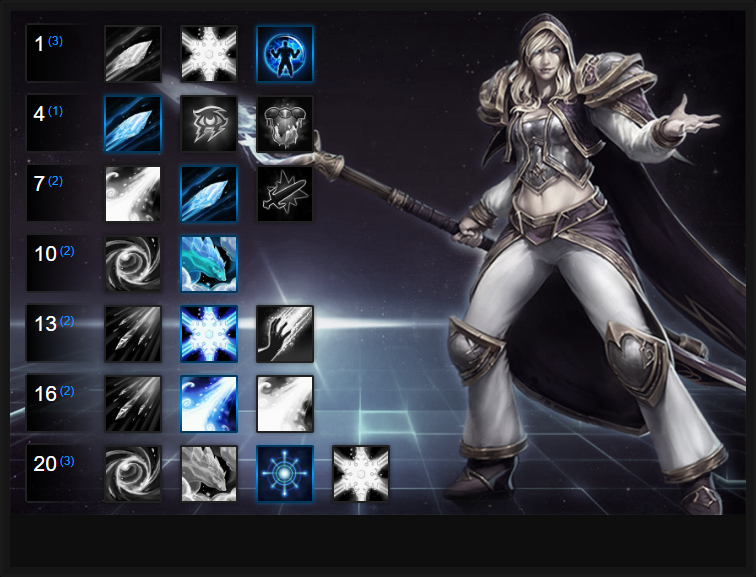 In this Jaina Build Guide, we provide an overview of her strengths, abilities, talents and matchups. Jaina is a ranged assassin and is arguably one of the most powerful in Heroes of the Storm. She has high burst, high amounts of crowd control thanks to her Trait ability to slow enemies affected by her skills and in the process, can comfortably control team fights. The fact all of her abilities slow opponents makes her amazingly useful at kiting but also preventing players from escaping during team fights. Despite her power, Jaina is also incredibly squishy and can die in seconds if she's out of position. Until later game when she obtains Bolt of the Storm or Ice Block, she's incredibly vulnerable. Having said that, she's more than capable of surviving against the likes of Nova or Zeratul if you you've a keen eye combined with Cone of Cold to blast them out of cloak. As well as positioning with Jaina, you have to be very aware of your mana use as well as your rotation. Poking with Winter's Reach is neccesary but combining Cone of Cold and Blizzard for maximum damage is key to bursting enemy Heroes down. Early game it's important to hold lane, roam for an early kill assist and return back to lane. Frostbite (Trait) - I would argue that Frostbite one of the strongestTraits in the game. Slowing any enemies hit by your abilities by 25% for 4 seconds is huge and considering it has no cooldown, you can comfortably use your 3 abilities and keep someone permanently slowed. Combined with amplified damage (that you can ramp up as you level up) Jaina offers one of the best bursts in the game and best of all, most of it is AOE. What's also particularly powerful about Frostbite is the fact that when you deal 15,000 ability damage, you also gain Improved Ice Block, allowing Jaina to become Invulnerable. Ideally, you want to gain Iceblock as soon as possible so be sure to join in on team fights as often as you can in order to reach the 15,000 damage threshold. Jaina's abilities, unsurprisingly, all revolve around area damage and slowing enemies. They all deal high damage, have moderate ranges by default (although Cone of Cold is quite short) but importantly, offer a huge amount of crowd control. Even if it doesn't state it on the tooltip, thanks to Jaina's trait they will all Chill targets causing anyone struck to move slower and having damage against them amplified by 50%. Make no mistake, if you land all your skills against a player with Jaina, they're going to explode. Frostbolt (Q) - Frostbolt is a relatively cheap but a vital component of Jaina's kit. It's efficient on mana, has excellent range, deals a fair amount of damage but importantly, it Chills targets. Frostbolt > Cone of Cold > Blizzard is a powerful combo. Considering its incredibly short cooldown, you should poke with Frostbolt as much as possible to soften targets up. Blizzard (W) - A long range AOE ability that deals significant damage to anyone who is hit in its radius, Blizzard is a powerful skill. Its default range isn't huge, but when talented can be considerably longer. It's great for clearing waves of minions, poking early game or during a team fight, Blizzard is an incredible ability you have to land. I will forewarn that Blizzard is very mana intensive early game, so be sure to use it against enemies caught in your Cone of Cold or those that are already rooted. As it has a slight delay before the ice shards descend, you need to take that into account and aim in the direction the enemy is heading. Cone of Cold (E) - A short range AOE, Cone of Cold deals high damage to anyone it hits. The fact it has a short range does place Jaina in harms way, so you need to not only position yourself so that you can use the skill and follow up with Blizzard, but also escape quickly. The best method I've found is to poke with Frostbite, tease back and forth with your movement towards the enemy and then use Cone of Cold at the furthest distance possible. Alternatively, you can use it when hidden so that you get a clean getaway once it has been cast. It's important to use Cone of Cold first in most encounters as it pairs with later talents. Ring of Frost (Heroic) - is an amazing Heroic that's incredibly powerful in team fights. It deals huge damage, roots enemies and chills those who touch the ring it leaves. Placing a Ring of Frost, followed by Cone of Cold > Blizzard is enough to wipe out an entire team. If you back that up with your allies there's very little chance of survival. What you do have to take into account with Ring of Frost is the fact it has a time delay before exploding, so try to cast it where you think players will be for maximum impact. In addition, those who remain inside the Ring of Frost (in its center) take no damage and won't be chilled. However, they will be succeptable for follow up attacks and have to pass through the outer ring to escape, where they'll then be chilled. Water Elemental (Heroic) - Many players I encounter use Water Elemental and in the current meta, it's incredibly strong.With a low cooldown, and a splash attack, the Water Elemental is amazing for harrassing a high value target (such as a Support). What's also great about it is the fact it has a decent health pool, meaning unless it's heavily focused, it can stay alive for a significant period of time. Jaina is fairly mana intensive, so allowing her to regain a maximum of 2 mana per second provides some much needed sustain. Fingers of Frost requires you to collect Regeneration Globes (which is fairly easy), but it also allows you to boost the damage of your Frostbite Trait by 10% when you find 20. It's easy to complete, and is a good boost of power mid to late game. Variable: Extending the range of Frostbolt by 30%, Winter's Reach allows Jaina to apply her trait to a target from safety but also prevent players from activating Objectives. It's fantastic on Battleground's such as Cursed Hollow. Frost Shards is a good alternative if you're seeking poke play. Having Frost Bolt's pierce and hit an additional target is incredibly valuable on objective heavy Battlegrounds and ensures Jaina can apply her trait to multiple enemies. Variable: Gaining one charge of block every 10 seconds (+50 armor), combined with a permanent chill effect against enemies that strike you, Frost Armor provides tons of survivability. It's great versus melee Heroes and even ranged Heroes, as they'll then be slowed and it'll allow you to follow up easily with Frost Bolt and Blizzard. Building on Frost Shards, Ice Lance allows Frost Bolt to restore 10 mana on hit but also reduces its cooldown by 2 seconds (from 4) allowing you to poke much more often. Water Elemental is great at the moment for its zoning potential, ability to harrass a high value target, while also applying a splash chill effect. It's tough to bring down, and great against mobile Heroes. Variable: As mentioned previously, Ring of Frost offers amazing group utility. A root, a huge damage spike and a chill after effect. It's a must have. I will add however that the slight delay on its activation means you have to predict where the enemy will be, and have it detonate at the right time. As long as players are inside the ring, at the very least they'll be forced to walk out. If they don't, they'll take huge damage from your Blizzard. Ice Barrier can be particularly useful against Heroes such as Zeratul where you hit them with a quick burst of damage from Cone of Cold > Frost Bolt. Converting 25% of the damage dealt to shielding that lasts 3 seconds can save your life. Variable: Absolutely incredible for chain spiking, Icy Veins allows you to reduce the cooldowns of your basic abilities three times as fast and reduces their mana cost by 50% for 3 seconds. It's brilliant for an early team fight and a must have upgrade. Use it before you enter a team fight, rattle through your rotation and be prepared to follow up for a second wave not long after. Considering your trait now allows you to deal 65% extra against chilled foes, Northern Exposure ramps this up by another 25% for 2 seconds. It's a must-have talent and allows Jaina to obliterate large groups of players. Just be sure to use Cone of Cold first, followed by Blizzard. If you're struggling to survive or are against a dive heavy composition, take Ice Blink. It's an instant teleport that will get you out of most situtations. These Hero Threat Levels (1 being lowest threat and 10 being highest threat) are to help you determine which enemy Heroes can give you a headache. Any Heroes that aren't on this list are easy pickings for Jaina. If a Hero is listed here, take greater care. Kael'thas: If he can target you he will outdamage you. If he has Pyroblast however, take Iceblock and survive it every time. Kerrigan: Staying out of her range is important as she can comfortably dive you or pull you in, before stunning you. If you're quick with your rotation however, there's a chance you can escape or harm her enough to make her panic. Murky: It might sound silly but Octograb + Pufferfish will essentially kill you. In a 1 v 1 Murky wins if he gets the drop on you. Thrall: There's very little Jaina can do against Thrall if he catches you out of position. Chain Lightning, leading into Feral Spirit allows him to spike you down. He can then follow up again with a Sundering or another Chain Lightning. Valla: Her escape makes her tough to kill and her sustain damage can mess you up. Your Frost Armor will help, but won't keep you alive against her rapid basic attacks. Zeratul: He is much like Nova, only he kills you a damn sight quicker. Your only hope is to catch him from cloak with a Cone of Cold to prevent his opening burst. This list of tips and tricks are just a handful of things we think will help your Jaina play. We'll continue to add to the list as required and if you have any tips you'd like to share, let us know in the comments below and we'll place them here. 1. Positioning is so important that I can't stress it enough. Stay out of the fray and be on the fringes of a fight. 2. Your heroic can turn a fight. Use it when you can lockdown their team - don't waste it. 3. Don't roam alone after level 7 unless you have to. There are many Heroes who can make your life miserable. 4. Always try to hit enemies with Cone of Cold first in order to gain the benefit of Frostbitten early. 5. Frostbolt should be used as often as possible to poke the enemy and keep them chilled. This allows for an easier and quicker burst with Blizzard. 6. Blizzard takes a second before it drops ice shards on the enemy so take this into account when attacking an enemy Hero. 7. Use Cone of Cold to clear minion waves instead of Blizzard: it has a cheaper mana cost. 8. Always take Ice Block if there's a Nova, Zeratul or Butcher on the enemy team. 9. Use the range advantage of Blizzard to push towers and hit enemy heroes hiding behind the gate. 10. During early levels, it's a good idea to roam from Top to Mid or Bottom to Mid. You'll usually be able to snag a few kills with a quick rotation of your abilities. Just pre-warn your team. 11. Be aware that early game your skills are mana intensive. Try to just use Frost Bolt and only use Cone of Cold and Blizzard when you're confident it will secure a kill. 12. Try to aim Ring of Frost so that it detonates with the most enemy Heroes in it. It takes some practice, but I've found it's most effective in a confined space when enemies are already slowed or rooted. You can't miss then.